Sometimes I wonder, how much testing you do. 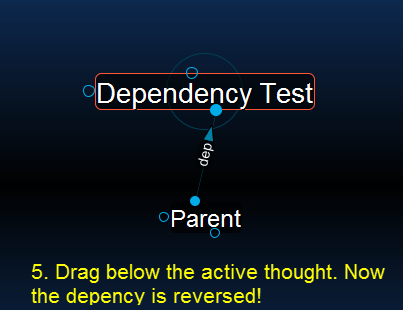 Try dragging the 'Parent' thought around the active thought and watch the direction mark. This doesn't instill trust in your product. I believe this is due to the way directionality is handled. Currently the arrow direction is determined by the way the link was created. 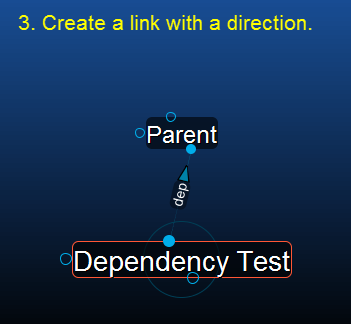 For example, if you dragged a link to a parent, the right direction arrow will first be created to point towards the parent. However, if you drag a link from a parent to the active thought, the right direction arrow will point towards the active thought. When you are dragging the parent thought around, in essence you are re-creating the link based on the parent thought (which you are dragging), so the right arrow will point towards the active thought. Note: I'm not saying this is intuitive, I'm just saying there is a method behind the madness, it's not due to the amount of testing done. did you reproduce this example? The arrow direction is not created by the way you create the link. It is determined by what you set in the 'Link Window'. Just imagine, you have link 'is Father of' and use a arrow to show the direction; the direction must be preserved, not matter which of the linked thoughts is active, is parent, is child or is neighbour. It must not change, if you drag one of the thoughts around. Yes, I did recreate the example, I just wasn't clear enough. Here's a way to illustrate what I mean. Drag a link from your active thought (I'm going to call it "Child") from the parent gate to create a new thought (I'll refer to this one as "Parent"). Click on the link to select. Click the circle button once to create an arrow. It will point left and the arrow will point from Child to Parent. 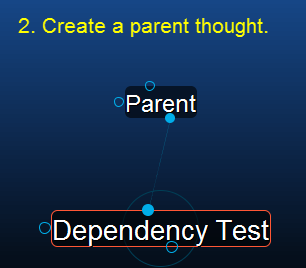 Activate Parent you created in the last example. Drag a link from the child gate of Parent to the thought Child. Click the link to select. Click the circle button to create an arrow. This time it will point right, from Parent to Child. So even though I only clicked once to create the arrow, it will either point towards or away from thought it was linked to, depending on how the two were attached (you can then reverse the direction by clicking the arrow on the Link Tool tab again). Make Parent the active thought, the arrow should still be pointing away from it to Child. 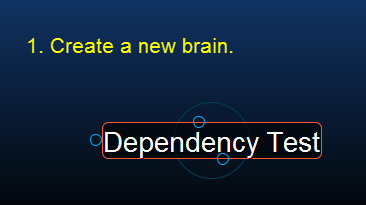 When I drag Child to make it the parent of Parent, TheBrain considers the link being created to be a new link. Because when we created that directionality it was not reversed (ie we clicked the arrow once) and because the link is being initiated by Child (it is the one you are dragging), the arrow that's created now points from Child to Parent, reversing the original direction of the arrow. Like I said previously, it may not be intuitive, but it does make sense once you understand the behavior. I have brought this to the attention of our engineers and they agree this behavior is a little bit confusing. I will log this as a bug and sent it to our developers for review. thank you for laying out the procedure and the explanation so carefully. But, as a user, do you really want to put so much effort into understanding such a seemingly simple feature? If we look at a brain more abstractly, it is a (mathematical) graph with nodes and arcs. Arcs can be directed oder undirected. For me, as a user, the arrows are just a means to create directed arcs. And once set, the direction of an arc doesn't depend on the position of the connected nodes, when these are moved around. That's all.